Introduction- Nagaland is located in the eastern part of India and was made late in 60’s after almost all the states came into existence. It is situated below Arunachal Pradesh and is covered by Manipur in the south and Assam in the west. The state receives a heavy amount of rainfall from June to September and otherwise the weather is very pleasant throughout. Nagaland is a beautiful place with high peaks, vast forest lands and is filled with aesthetic beauty, that’s why it is often called – “The Switzerland of the East”. Capital- Kohima is the capital of the state and has its name derived from a plant called ‘Kewhi’. Kohima has access to all types of transportation. The city is located at some height and modes of travelling the city are buses, auto and rickshaws. Culture and lifestyle- The tribes in Nagaland are seen involved in various handicraft activities like pottery, woodcarving, black smithy and bamboo work. 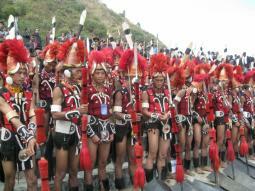 Major tribes of the state are Phom, Ao, Chang, Pochury, Sema, Rengma, Angami and many more. Various cottage industries like woodwork, weaving and Tourism is also a source of revenue for people. Weather- The state experiences a humid sub-tropical climate where winters are cool and the summers are really hot and humid. During the winters, temperatures are quite low and frost and snowfall occurs at higher altitudes. In summers the temperatures shoot up to around 32 degrees and heavy rainfall is seen. "Switzerland of the East" because of the 'Hawala' transaction to Swissbank.